Emos survive any suicide-inducing neurotoxins because they spend their days already contemplating suicide but are used to holding it off. Hey! I found this in the Internet. Hey, who knows… Maybe they’ll write a song about how they withstood the suicide tree. Then they’ll turn it around and make the tree a metaphor for LOVE and how everyone succumbed to it but they didn’t because they were too immersed in their own little world. Wahahahaha. please tell me this isn’t a spoiler for the happening? uhmm.. I don’t know what to say, rehaz… but errr…..
Is Franchette going to become a regular character or is she only going to be temporary like Gundam Girl? Hey, not all emo people are sad and depressed. I met a really amiable emo guy in toycon who was nice enough to sign the comic I bought from him with his own blood. I mean he “happily” cut himsef y’know. Talk about courteous. If you’re happy and you’re emo, cut your your nose. Hey! that reminds me of my pitiful emo friends! One time, they said to me that they wanted to die. So I told them to go ahead. I even suggested ways for them to die. The next day, they quit being emo. I guess reverse psychology works! If you’re happy and you’re emo hang yourselves. Mary: Marius is NOT emo. He is goth. You mean to say, if you sign your name with your your blood then you’re an EMO, what the heck then Andres Bonifacio and the Balintawak guys must be EMO. What’s with all these EMO bashing? I don’t think half the people who think they know what EMOs are like are correct. What’s with these generalizations? What’s all this negativity? The guys on the strip look more like jologs than emos.. But then again, who am I to say what jologs are? well, chompy, emo-bashing is one way for me release. It’s fun to categorize them as suicidal. Although, the emo music genre could be great, the lifestyle isn’t. 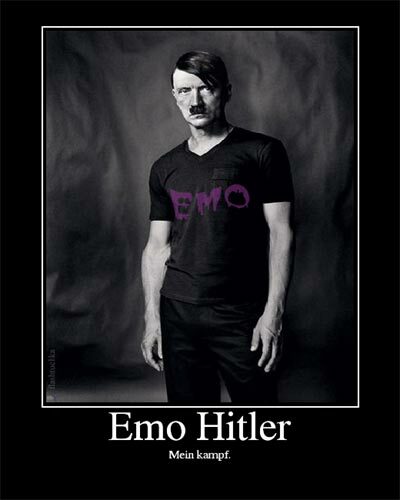 Emo is also often associated with a certain fashion. The term “emo” is sometimes stereotyped with tight jeans on males and females alike, long fringe (bangs) brushed to one side of the face or over one or both eyes, dyed black, straight hair, tight t-shirts (sometimes short sleeved) which often bear the names of emo bands (or other designer shirts), studded belts, belt buckles, canvas sneakers or skate shoes or other black shoes (often old and beaten up) and thick, black horn-rimmed glasses. Emo fashion has changed with time. Early trends included straight, unparted hair, tightly fitting sweaters, button-down shirts, and work jackets. This fashion has at times been characterized as a fad. I’ve watched the happening… and it was really… refreshing to know that plants can make you kill yourselves. Ok, my bad, Marius AKA Luci is Goth, granted. But if you ask me Emo and Goth people have too many similarities and little difference to me. At least Marius was the first cheerful Goth I ever met. I pity emos actually. Really, I think it’s a waste of time to wallow in so much despair and negativity. They should just convert into geeks, at least they’d find happiness and excitement in life, okay granted both kinds need to get a life but hey, I think geekiness trumps emo any day. the difference that draws the thin line of being emo and being goth is the fact that goths are more likely to be vampiric while emos tend to be suicidal. No “Big Apple” in the list? And if there was… Isnt’ there an “all of the above”? Ken: maybe emos are voluntary vampire food? Phoebs, If I can only see them copulating. But hey, I was a self-described goth 10 years back, a happy-go-lucky kid with an insatiable blood-lust, just like dracula on weed. its about music not fashion. Why don’t they just slit their throats so they could stop complaining about how worthless their lives are? Sublime: I think the spelling is Imus….not sure. Ayumi: I checked, according to wikipedia it’s emu. Hate to steretype, pero naimagine ko lang ang emu kung emo sya. hahaha. Moaning Myrtle, is a cool EMO, she’s still contemplating on killing herself even if she’s already a ghost. Killing Jews while screwing a Jewish Sl (u) t.